No sign of the regular workmen this week. The electrician, however, was out earlier in the week and installed the ceiling fixtures and 4 of the 8 fans. The fans are clear acrylic with a blue neon light inside the housing. This showed up in our yard today. No idea what for. Maybe the grading around the building? Here are some photos of my business trip to Seattle WA last week. This is the beautiful panoramic view that the AOL Seattle office has. That's Lake Union in the center, where you could watch the sailboats and the sea planes taking off and landing all day. We ate at a couple restaurants right on the water. Gorgeous area. The view of the "Space Needle" from our hotel. I meant to go see it but never had the time. I was told there is a science fiction museum in the area too. Oh well, maybe next time. I guess I should mention that I have around 40 vintage Simon games that I plan on assembling into a giant computer-controlled sound-responsive pop art lighting fixture for the gameroom. Looks like they worked on the railings yesterday. Sorry, I meant to upload these last night, but our power went out. Looks like the painting it pretty much done. 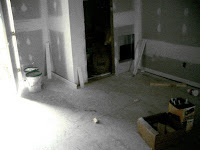 The electrician was also out to put in some of the electrical fixtures. And this is the window box for the upstairs window. I'll be out of town until Thursday on a business trip for AOL. I'll resume posting construction updates when I get back! "...it pretty much craps all over the greatness, honesty and really charming portrayal of the Arcade Game Movement of the 70's in Chasing Ghosts." Still painting! They've got the black, the red, and the green. Still to come - bright yellow, dark blue, and light blue. They've primered all the walls now except for one. They painted the red section today. Sorry for the poor quality of the photos - the light was really bad by the time I got home. 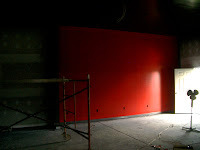 They painted all the black areas today, and primered the areas that will be red. 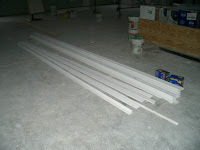 They also finished the moulding downstairs. Since the last update, they've done a little more on the floor molding - finishing the upstairs and getting about halfway done on the downstairs molding. They also installed locks on the doors (and knobs for that matter). Today they started painting. 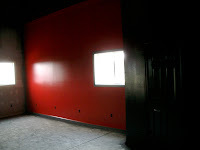 They finished the upstairs, and put a dark primer coat on the parts downstairs that are to be painted black. They worked more on the floor molding and window trim today, and installed the doors for the downstairs AC closet and bathroom. I would have taken pictures but it was too dark by the time I got home. 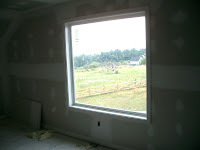 Now that the drywall is done, they have started adding the trim around the floors and windows. They only got as far as the upstairs today (and jeeez it was hot today!). 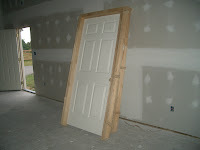 They also added some access doors to the crawlspaces. 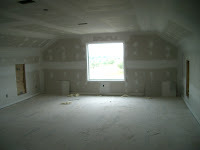 The drywall is all finished. Not sure how they are going to handle the problems I mentioned previously, but it's technically done. 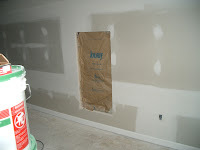 Painting should be soon! I'll skip the photos since it doesn't really look any different from my last post.